At Atlantic Dental Cosmetic & Family Dentistry we believe it is important to provide our services in a comfortable and relaxing atmosphere. That is why we offer dental spa amenities including paraffin treatments, warm neck wraps, and massage chairs. Providing an enjoyable environment enhances your experience by allowing a break in your hectic day. Come in and make yourself at home. We are proud of our Ocean City dental office and have included pictures here so you can know what to expect when you walk in our door for your appointment. Whether you are a new patient or a valued existing patient, give us a call to make an appointment. We look forward to hearing from you. Upon entering Atlantic Dental you will immediately realize you are at a dental office unlike no other. Soothing spa music, art-deco lighting, and bamboo flooring greet you. Immediately, patients have remarked that they feel as though they have entered an art gallery. Photos of local Eastern Shore interests are prominently displayed at the entrance. In the waiting area a beverage bar awaits you. For the patient on the move, there is fresh fruit, cool lemon water, assorted juices, and hot flavored teas available at no charge. Waiting patients can experience the breath taking view of Herring Creek while they can enjoy the use of a foot massaging unit placed around this soothing space. Feng Shui is incorporated with Bamboo plants, a water wall, and aromatic aroma therapy scents. As patients are escorted to the state of the art operatories, they will receive a warm paraffin hand wax, and a heated scented neck wrap as they sit in the massaging dental chair. Blankets warm the chilled or nervous patient. Patients have the ability to view their own digital x-rays and cosmetic photos on the monitors in front of them. 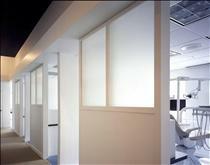 Within the office is a high tech digital panoramic and radiographic unit. This unit provides wonderful radiographic images with 90% less radiation than older traditional units. Our check out area is "HIPPA" designed for confidentiality where privacy is respected. This area is visually enhanced by unique lighted countertops, with brushed stainless steel fronts, bold blue ceilings, and a floating glass wall.